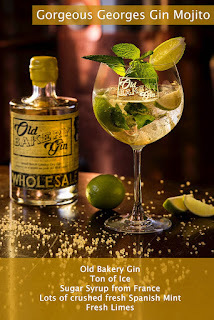 The Old Bakery Gin Distillery is opening a pop-up Gin Palace in its distillery in Pymmes Mews, N13 on Saturday 28th July. Go for their gin cocktails, but also to buy bottles of their gin, produced on the premises, and their lovely 'Copa' glasses, which will make your gin cocktails taste even better when you make them at home! Warm yourself by our open fire and enjoy all things Gin. Are you a sweet or savoury person? Drinks served in a large Bespoke Old Bakery Gin Copa Glass which are available for Sale £10 each."